Well, this place is a surprise – firstly, it’s in Sydney’s Redfern, and secondly, from the outside, it certainly doesn’t look anything like a Top 100 restaurant. In fact, we went past a couple of times in the taxi trying to find something that looked like a restaurant. It’s upstairs on a corner and there’s hardly any signage to be seen. But, one thing is for sure, the food is out of this world! This is no ordinary Korean food. It’s modern Korean, with interesting twists and combinations. Probably the most interesting food I’ve had in a while. And seriously… THE BEST CHICKEN EVER!! It may only be classed as a ‘side dish’ for $12 but the 4 decent sized pieces of Shrimp Brined Fried Chicken with Soy and Syrup is worth going for alone. Truly the most tasty chicken that ever was! We were in raptures, and I still can’t stop thinking about it. We enjoyed it all – from the Bulgogi Beef Short Rib and Anchovy in Sweet Cabbage for starters, to the Bibimap: Oxtail & Rice, Walnuts, Sweet Corn and Cured Egg Yolk. Apologies for the poor quality photos but it was pretty dark in there! THE BEST CHICKEN EVER!!!! 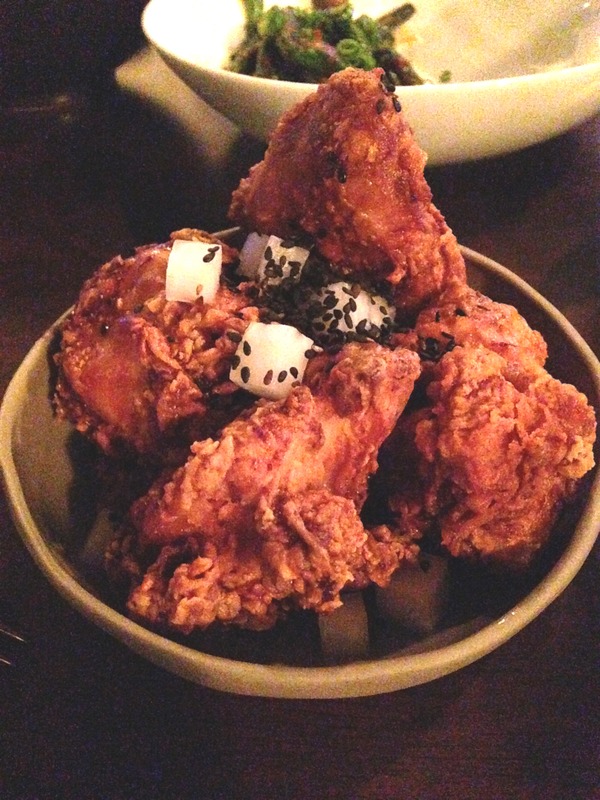 Shrimp Brined Fried Chicken with Pickled Radish, Soy & Syrup – classed as a side dish but this is magnificent! Bulgogi beef short rib and anchovy in sweet cabbage – eaten san choy bao style! I ate at Moon Park a few months ago and reckon you are on the mark. Creative, stylish, deconstructed traditional Korean dishes served in a more modern style, yet retaining the amazing flavours and textures of the original . The egg custard is worth moving to Sydney for! The food and ambience were great, but the service was excellent. The wine list is challenging, so give yourself over to the recommendations of the person serving you. Check out the kitchen too… I reckon 9/10 . Take your specs..it dark.